An opal is a periodic stacking of polymer or silica beads of a few hundred nm obtained by self-organization of a solution of beads. In this 3D photonic crystals, the propagation of light and the emission of a nanocrystal can be greatly enhanced or inhibited, depending on the considered wavelength and direction. By infiltrating a solution of nanocrystals inside an opal, we have evidenced in 2009 an inhibition and redirection of the emission from nanocrystals and we have shown, in 2015, that this emission could be efficiently filtered by a heterostructure composed of a planar defect sandwiched between two opals. 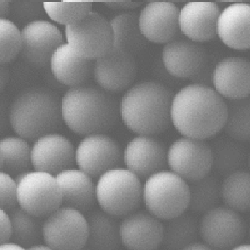 Figure 1 : Sem images (D. Demaille, INSP) of opals synthesized at the INSP : (a) Opal covered by a layer of larger beads by Langmuir-Schaeffer method and a second opal by convective method. (b) Opal covered by a silica layer by sputtering and a second opal by convective method (the red arrow indicates the thickness of sputtered silica). We developped in 2010 an activity of fabrication of opals at the INSP : beads synthesis, opal deposition by “convective” method. We have introduced a (voluntary) planar defect in an opal consisting either in a silica layer (fig. 1b) or a layer of larger beads (fig. 1a). 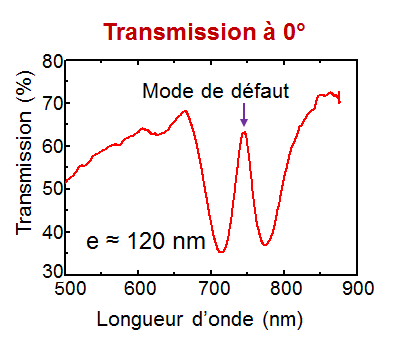 The transmission spectra of these samples present, inside the dip corresponding to the photonic crystal stop band, a pass band corresponding to a defect mode (fig. 2a). 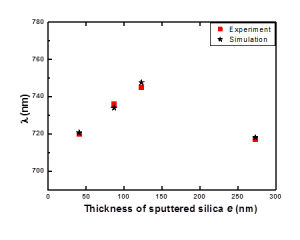 The wavelength of this mode can be adjusted with the silica thickness (which is well controlled during the deposition process) and is in perfect agreement with the results of FDTD simulations (fig. 2b). 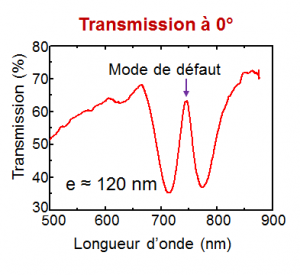 Figure 2 : (a) Transmission spectrum of an opal with a defect (120-nm silica layer deposited by sputtering) at 0° incidence angle. (b) Evolution of the defect mode wavelength measured (red squares) and simulated (black stars) as a function of the silica layer thickness. P. N. Hong, H. Frederich, J. Laverdant, L. Coolen, P. Benalloul, J.-M. Frigerio, P. T. Nga, A. Maître et C. Schwob, Synthesis and characterization of self-assembled photonic crystals for enhancement of single nanocrystals photon emission, 5th International Workshop on Advanced Materials Science and Nanotechnology (IWAMSN2010), Hanoi (Vietnam), Novembre 2010. 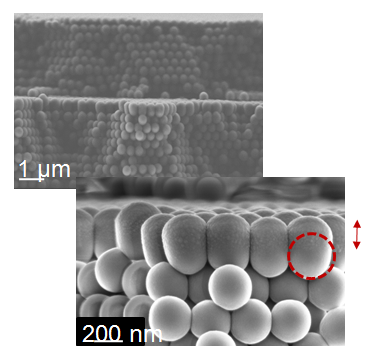 Céline Vion, Carlos Barthou, Paul Bénalloul, Catherine Schwob, Laurent Coolen, Alex Gruzintev, Gennadi Emel’chenko, Wladimir Masalov, Jean-Marc Frigerio, et Agnès Maître, Manipulating emission of CdTeSe nanocrystals embedded in 3D photonic crystals, Journal of Applied Physics, 105, 113120 (2009). Catherine Schwob, Céline Vion, Amayry Avoine, Carlos Barthou, Paul Benalloul, Laurent Coolen, Jean-Marc Frigerio, Agnès Maître, Alex Gruzintsev, Gennadi Emelchenko, Wladimir Masalov, et Pham Thu Nga, Manipulating emission of CdSe/ZnS nanocrystals embedded in 3D photonic crystals, 2nd Eureopean Topical Meeting on Nanophotonics and Metamaterials, 5-8 Janvier 2009, Seefeld, Tirol, Autriche, Nanometa 2009. C. Vion, C. Barthou, P. Benalloul, C. Schwob, L. Coolen, A.N. Gruzintsev, G.A. Emelchenko, W.M Masalov, J.-M. Frigerio, A. Maitre, Manipulating Emission of CdSe Quantum Dots Embedded in Synthetic Opals, 14th international conference on II-VI compounds, Saint Petersbourg, Russie, 23-28 Août (2009).